Follow these tips to get the best possible finish when painting on top of oil-based paint. If you’re painting over oil-based paint—say, on kitchen cabinets or trim—it’s best to use more oil-based paint. Switching to a water-based or acrylic paint might cause peeling or chipping because those formulas don’t bond as well with the naturally glossy surface of oil-based paint. You can, however, get around this. First, sand off as much gloss from the surface as possible, and wipe away the dust. Next, banish dirt and grime, which can also reduce the adhesion of water-based paint, by cleaning with diluted trisodium phosphate. Now, it’s always a good idea to prime, but especially when using water-based paint over oil-based paint. Bonding primer, which is formulated to stick to glossy and other hard-to-paint surfaces, will prevent peeling and chipping while the fresh paint dries and cures. Finally, apply at least two coats of water-based paint. 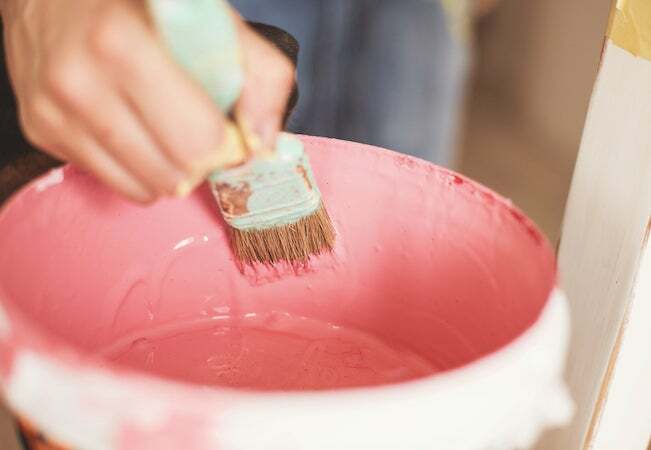 Just take care to grab the right paint: “interior/exterior” paints will work anywhere, as the label suggests, but “interior” paints won’t hold up when exposed to the elements.